Eighteen people have been successfully released by French special forces from a Primark shop in a district near Paris, after gunmen took them hostage in a failed robbery attempt. 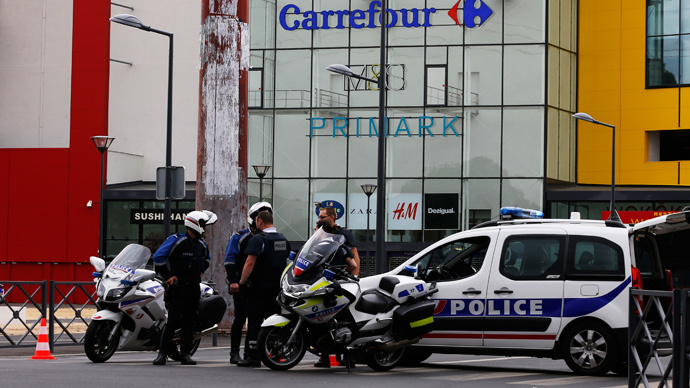 The dramatic situation at a Primark store in Villeneuve-la-Garenne commune in the Hauts-de-Seine region northwest of the city started early in the morning, French media reported. As armed robbers entered the shop, one of the employees sent a text message to her boyfriend reporting the situation. Police deployed the elite RAID team to the scene and cordoned off the area. The gunmen were barricaded inside the shop. French media say there were two or three assailants involved in the hostage-taking. Fortunately, the situation was resolved with no bloodshed. It was not immediately clear whether the attackers managed to escape or hid in the large shop during the police operation and sneaked out. The Villeneuve-la-Garenne Primark is one of 165 stores located in the Qwartz mall, where the hostage-taking happened, and one of five the brand has in France. No evidence suggests this is a terrorist act, according to police sources cited by the local media. Traffic was rerouted in the Qwartz mall neighborhood, and shops were closed.